Is it surprising that three of the top fashion designers of the last 100 years had Hoosier connections? Bill Blass, who became internationally known for his classic sportswear and evening gowns, was a native of Fort Wayne. In Evansville, Roy Halston Frowick attended Bosse High School. Eventually calling himself just Halston, he created the pillbox hat worn by Jacqueline Kennedy as first lady. Then he designed dresses worn by celebrities such as Liza Minnelli and became a celebrity himself at the epicenter of Manhattan's fast-paced nightlife of the 1970s. And from the early 1940s through the late 1960s, the country's foremost fashion designer was Norman Norell, who grew up in Noblesville and Indianapolis. 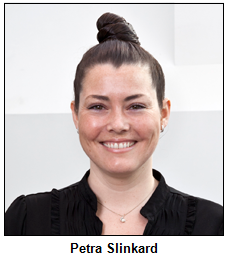 To explore the lives, creations and careers of these icons, Nelson will be joined in studio by Petra Slinkard, curatorial associate at the Indianapolis Museum of Art. The museum features clothes created by the three designers in An American Legacy: Norell, Blass, Halston & Sprouse, an exhibit that opened earlier this year. It includes an evening gown created for former first lady Nancy Reagan by Blass, who designed the red dresses she made famous in the White House. Although the three designers flourished during different eras, which were reflected in their designs, there may be some common, uh, threads. "All of them were intensely creative individuals with a strong work ethic that was very Midwestern," Petra Slinkard notes. Blass (1922-2002), a 1939 graduate of South Side High School, had a turbulent family life in Fort Wayne - his father committed suicide in their parlor when Bill was 5 years old - before he moved to New York to study fashion. His eventual mentor was Norell (1900-1972), a member of the Levinson family, well-known clothing retailers in Indiana. Norman David Levinson created the name "Norell," which he explained this way: "Nor is for Norman. L for Levinson. Another L for looks." His clients included some of the world's most glamorous women, such as Lauren Bacall. Unlike the other two famous designers, Halston (1932-1990) was not born in Indiana; he was a native of Iowa. But he spent most of his youth in Evansville and even attended Indiana University before heading to New York. The IMA exhibit includes a green and yellow gown he designed in1972 based on "flowers" paintings by Andy Warhol. "Warhol and Halston were friends, had a similar outlook on life and surrounded themselves with the same people," Petra Slinkard notes. "It was inevitable that the most popular artist of the era would collaborate with the top designer." All three designers won multiple Coty Awards, the top honor in the American fashion industry. In fact, Norell won so many Cotys in the late 1940s and 1950s that he was the first designer inducted into the industry's hall of fame. Norell also became the first fashion designer to market his name on a perfume, which made its debut in 1968. Eventually, he was vastly eclipsed in product marketing by Bill Blass, who lent his name to everything from bed linens and fountain pens to chocolates and fragrances. When Blass, who was known for designing classic looks that always stayed in style, retired in 1999, he sold his company for $50 million. Halston's business experiences did not have positive outcomes. In the 1980s, he negotiated a deal with JCPenney to sell his creations, which backfired because more upscale retailers immediately dropped him, Petra notes. Even worse, Halston eventually lost the right to use his own name because of tangled agreements with conglomerates. In the designers' heydays, though, clothes by all three not only were purchased by celebrities, they also were sold to Hoosiers by locally owned retailers such as L.S. Ayres, Block's and Wasson's. 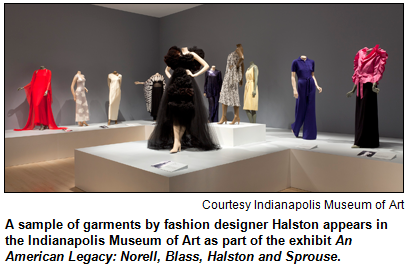 In addition to the creations of Blass, Norell and Halston, works by another top fashion designer are featured in the IMA exhibit. Stephen Sprouse (1953-2004), who grew up in Columbus, got his start working for Halston in the late 1970s. Influenced by punk rock and graffiti, he introduced what the IMA calls "street style" to high fashion. 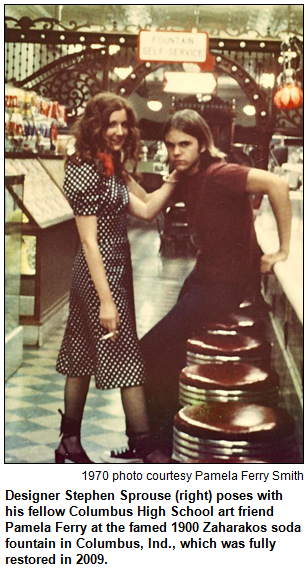 Like Halston, Sprouse died after a fast-paced lifestyle. In addition to being the home state of top designers, Indiana also produced the fashion industry's best-known publicist. Crawfordsville native Eleanor Lambert (1903-2003) revolutionized fashion coverage by inventing the International Best Dressed List in 1940. During World War II when restrictions were placed on fabrics such as silk, Norell used sequins and jewels on dresses to mask cheaper fabrics. Eventually, his sequined "mermaid" sheaths in various fabrics became one of his signature styles; they also became some of the most expensive dresses in America. Partially because of the impact of World War II on French designers, Norell elevated the American fashion industry to unparalleled esteem in the 1940s. "Made Seventh Avenue the Rival of Paris" was the front-page headline in The New York Times when Norell died in 1972. In his posthumously published autobiography Bare Blass (HarperCollins, 2002), Bill Blass indicates his boyhood interest in fashion was inspired in part by a fellow Fort Wayne native. While watching movies, he was intrigued by the glamorous gowns worn by actress Carole Lombard. 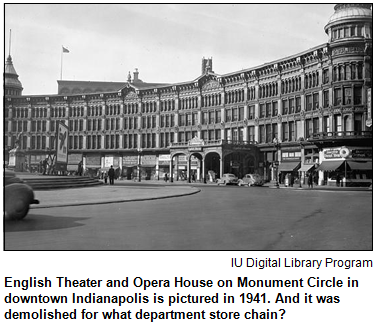 On Monument Circle in downtown Indy, a department store replaced the lavish English Theater and Opera House, which had been built in the 1880s. The demolition in the late 1940s of the ornate English structures, which also included a hotel, to make way for the new department store continues to be regarded as an outrage by historic preservationists. The department store, part of a national chain, was in a building that, like its English predecessors, was curved to mimic the curve of Monument Circle. The department store remained on the Circle for not quite 30 years, closing during the 1970s with the decline in downtown shopping before the rejuvenation of downtown. Question: Name the department store. This week's prize is gift certificate to Tastings at the Conrad Hotel in downtown Indianapolis, courtesy of the ICVA. The prize package also includes a pair of admissions to Conner Prairie Interactive History Park, as well as a pair of 1859 Balloon Voyage tickets, courtesy of Conner Prairie. By the way, a big congratulations to last week's winner, who called in from the Irvington Library Hoosier History Live! listening group. The group meets informally each week to listen to the live show. 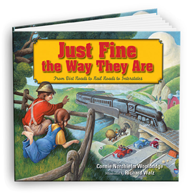 Thanks to the Indianapolis Public Library, Irvington Branch, for providing a place for the group to meet, as well as a radio and books and other "learn more" materials that pertain to the show's topic. The group welcomes new members. By the way, it's easy to form your own listening group; all you need is a quiet space to meet weekly and access to a radio and/or a laptop for online listening. It's a great way to explore history in a face-to-face setting. If you are a small business, it's a good way to bring people into your business each week! As Roadtripper Chris Gahl of the ICVA was not able to get through our ever-humming phone lines on last week's show, we thought we would again have him call in about one of Indy's hidden treasures: German Park on Indy's far southside. At German Park, you don't have to be German or have a membership card to dance the night away at the German Park summer festivals. Expect beer, brats, fun and games for the kids, and dancing in the old pavilion with a live band. In 1881, 30 acres were purchased at 8600 S. Meridian Street to create Germania Park. 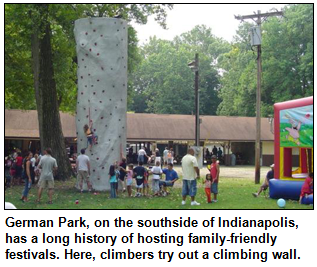 Now known as German Park, the private park is owned and operated by the Federation of German Societies in Indianapolis and boasts a number of summer festivals. The next Summerfest will be Saturday, July 21, hosted by the Indianapolis Saenger Chor. Die Freudemacher will be playing that evening, and gates open at 5 p.m. Admission for adults is $3. Also located on the grounds of German Park is the Edelweiss Restaurant, which is open to the public for dinner Tuesday through Saturday from 5 to 9 p.m. The restaurant serves sauerbraten, wiener schnitzel and other German delights. Please tell our sponsors that you appreciate their support: Aesop's Tables | Just Fine the Way They Are, a children's book about the National Road | Indiana Historical Society | Kurt Vonnegut Memorial Library | Lucas Oil | The Society of Indiana Pioneers | Story Inn. More than 50 years after his colorful grandfather, as a dark-horse, maverick presidential candidate, took on Franklin D. Roosevelt, David Willkie made his own headlines. 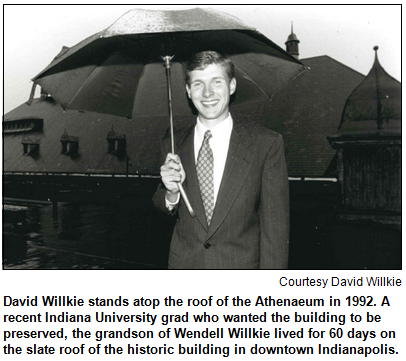 In 1992, he lived for 60 days on the slate roof of the Athenaeum in downtown Indy as a fund-raising ploy to help save the historic structure from possible demolition. So David will join Nelson in studio to share insights about two topics: the life of Wendell Willkie, the Republican Party's nominee for president in 1940, and the roof-living stunt as a recent college graduate atop the building that was designed in the 1890s by architect Bernard Vonnegut and became the hub of German cultural life in the Hoosier capital. A caveat: David never personally knew his grandfather, who died suddenly in 1944 at age 52. He has fond memories, though, of his grandmother, Edith Willkie, who almost became the country's first lady. She was from Rushville, the town from which Wendell Willkie, a native of Elwood, based his presidential campaign. David, who grew up in Rushville, recently settled in Indianapolis after serving for several years on the staff of U.S. Sen. Richard Lugar. During several Hoosier History Live! shows, studio guests have shared memories or anecdotes about the unlikely presidential campaign of Wendell Willkie, a self-made business leader who never had held elective office of any kind before his unsuccessful crusade to stop FDR from winning an unprecedented third term. The chant "We want Willkie! We want Willkie! We want Willkie!" swept delegates to the 1940 Republican convention, which had been deadlocked on more traditional candidates. 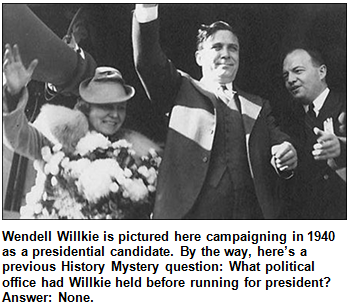 "The miracle of modern politics," analysts called the upset nomination of Willkie. Although Willkie had been sharply critical of aspects of FDR's New Deal and was defeated in the general election, he became a good friend of his rival. In fact, President Roosevelt even designated Willkie to be his personal representative to the Allied nations of Europe. Decades after her husband's untimely death, Edith Willkie periodically brought her young grandson, David, to the Athenaeum, 401 E. Michigan St. So those visits were among David's personal connections when he camped out atop the building's roof in 1992, the 20th anniversary of which will be celebrated this fall during GermanFest. During his 60 days of roof-living, David was interviewed by everyone from WFBQ-FM's Bob and Tom to national media. He says he even received a phone call from literary lion Kurt Vonnegut Jr., the grandson of the architect, who expressed concerns about David's health and safety. Tune in to our show to hear more anecdotes about the effort - and about one of the most intriguing political figures in Hoosier history.